What is the secret to making something instantly adorable? Make it miniature of course! 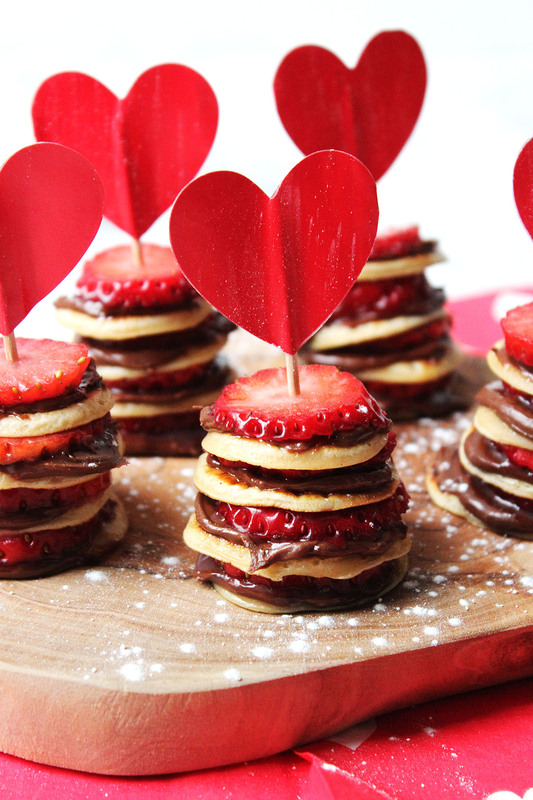 These Mini Nutella and Strawberry Pancake Stacks are the cutest! Scroll down for the recipe. 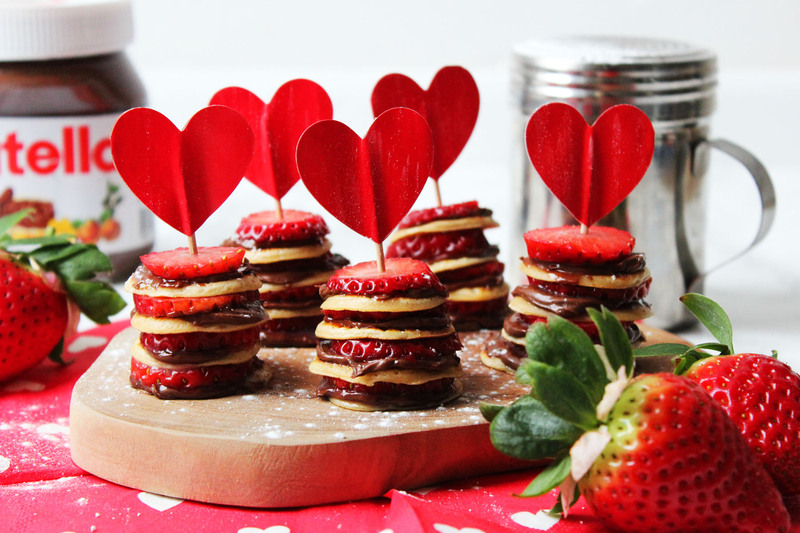 The first time I made these Mini Nutella and Strawberry Pancake Stacks I didn’t actually make the pancakes. I had had a long day at work and decided to buy a bag of Diddy Dutch Pancakes from Abra-ca-Debora that I’d seen in the chilled food aisle at the supermarket. It was pancake day and I just didn’t have the time to make pancakes from scratch. That’s right, these pancake stacks were really just an assembly job that required absolutely no cooking. So, I warmed the tiny pancakes through, spread each one with Nutella and painstakingly stacked them with a strawberry in between each. They were the most adorable stacks of pure happiness and Jon and I devoured a whole plate of them. We were stuffed silly by the end of it! The concept was clearly a good one and ever since I’d been trying to find a reason to make them properly but pancake day comes but once a year! That pancake day with Jon where we tucked into store bought pancakes was actually the first pancake day we spent together in our flat. I’ll admit, I somewhat felt like I had let him down by not making pancakes from scratch. When I was a child we always had homemade pancakes, no matter what. My Mum will be the first to admit she’s not much of a cook and so it was always Dad who tossed the pancakes in the kitchen. Usually he’d come home just in time for dinner and head straight to the kitchen to make pancakes in his suit. I have such fond memories of the pancakes coming out of the kitchen, one at a time. As the youngest I always got my pancake first, then my sister and then my Mum. We’d have 3 or 4 each – or as many as my dad could get out of a big batch or two of batter. He’d always make sure that he put a couple on a plate for himself and keep them warm in in the oven. Once we’d had our fill he’d sit down at the table, squeeze over some lemon juice, sprinkle them with sugar and enjoy his pancakes. Looking back I have no idea how he managed to show so much self-restraint, making sure we were fed before he got to eat his. Especially considering that he’d been at work all day! Never again will I use work as an excuse to buy ready made pancakes. If Dad can do it so can I. Getting back to the matter in hand…what makes these pancake stacks so awesome is their size! 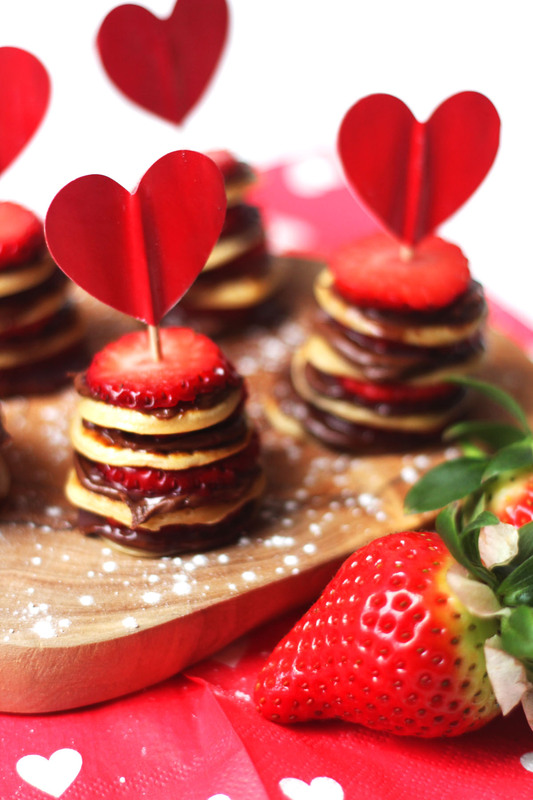 Whether you’re feeding little people, just trying to exercise some portion control, or just want to make an adorable breakfast for your sweetheart, these mini Nutella and strawberry pancake stacks are ideal! I make my teeny tiny pancakes roughly 1.5 inches in diameter. Any bigger than that and you can’t stuff them in your mouth all at once! These stacks are bite size. Almost like a breakfast canape! You’ll find full details of how to make them in the recipe card below, but to make make these miniature pancakes I’d really recommend investing in a squeezy bottle. (You can also use it for my lace heart pancakes recipe!) If you don’t have a squeezy bottle don’t worry, a spoonful of batter will make roughly one tiny pancake. Scroll down for the full recipe. Serving Size: 4 pancakes per stack. Put your flour and salt into a large bowl and make a well in the middle. Add the egg and whisk to make a paste. Next add in half the milk and bring it into a smooth batter. Stir in the rest of the milk slowly and then whisk until it’s smooth and bubbly! Pour the batter into a squeezy bottle (optional). Brush a frying pan with oil and heat on high until it is piping hot. Squeeze (or spoon) the batter into circles roughly 1.5 inches wide in the pan. Let the pancakes cook for roughly 2 minutes. Using a spatula, carefully flip and cook for a further 2 mins or until golden! Repeat until you have used up all of the pancake batter. Let the pancakes cool slightly before spreading with Nutella and stack with a slice of strawberry in between each (maximum 4 mini pancakes per stack). Secure with a tooth pick. Lightly dust with icing sugar before serving (optional). Although you’ll have to cook these cute pancakes in batches they will be well worth slaving over the hot stove! Have I convinced you these are worth making this pancake day? Make sure you’ve pinned the recipe for later. Just click the image below. I love these mini bites of deliciousness ! I think Nutella and strawberries is the perfect combination too! Great idea for Valentine’s Day or any day! Thanks Lia! You know me, any excuse for a naughty treat 😉 these photos were taken weeks ago hahaha! Will you be making pancakes for shove Tuesday? ! Yummy treats are valid any day of the year! They are lots of fun 🙂 they’d work well with banana and other fruit sandwiched between the layers too! They are fun aren’t they?! Fab for little hands too 🙂 I’m a big kid at heart and love finger food so these totally appealed to me!! These little pancakes are supper cute and you can’t go wrong with chocolate and strawberries. I made some chocolate cashew spread yesterday which is gorgeous, so would be just the thing here. Wow chocolate cashew spread sounds amazing!!! I’ve tried making nutella in the past but it’s not had the desired consistency…what is the cashew nut spread like? Yummy these remind me of the mini pancakes that I once bought at Westfield (Shepherd bush), topping was Nutella, strawberries and peanut butter! These look so delish, a perfect Valentine’s breakfast. Nutella and strawberries are such a natural combo that it’s crazy I’ve never tried it before! Such a cute presentation of our favorite breakfast food! love the decoration flags too,so festive! Thanks Noel 🙂 I’m glad you like them! Aren’t the hearts and sparkles just the cutest? These are just so adorable, and look mighty tasty too! These are super adorable and sound delicious, my kids would go crazy for them! Oh these are gorgeous! So cute! My daughter would adore them, I shall surprise her asap! These are so cute. My husband is Nutella obsessed, so I know he would love something like this tomorrow.